USN Protein Delite Bars contains up to 30g of high quality protein, and also advanced Whey Protein Isolate. Each bar is full of delicious taste, to provide you with a delicious snack while you achieve your training goals. Made from a carefully measured combination of oats, whey protein isolate crisps, coconut oil, flaxseed and other nutrient dense ingredients. Tropical Punch is unique combination of papaya, cashews, almonds, coconut, pecans, cranberries, brazil nuts, hazelnuts and raisins to create a TPW™ first! Protein Granola from THE PROTEIN WORKS™ takes the classic granola to a whole new level. Using the very latest protein fusion technology, the TPW™ team have created a unique super-breakfast to help boost your early morning protein intake. Protein Granola has been nutritionally enhanced with organic coconut oil and flaxseed. It has also been naturally sweetened with honey and apple juice to create something pretty special. TPW™ Protein Granola not only tastes great, but it can be combined with a wide range of fruits and yoghurts, making it incredibly versatile. Breakfast time will never be the same again! Serving size: 50g portion recommended. We recommend 50g per serving. Protein granola can be enjoyed straight from the pot on its own or with other nutritious ingredients such as TPW zero syrups, greek yoghurt or unsweetened almond milk. Oats (gluten), isolated Soya protein, Tropical Mix (papya, cashews, almonds, chipped coconut, raisins, pecans, brazil nuts, hazelnuts, Dried cranberries ( cranberries, sugar, sunflower oil), Honey, Whey protein isolate crisp (whey protein isolate (milk), rice flour, emulsifier (soya lecithin)), coconut oil, oat protein, apple juice concentrate, malted toasted oats (wholegrain oat flakes , malt extract ( from barley), palm oil) flaxseed. 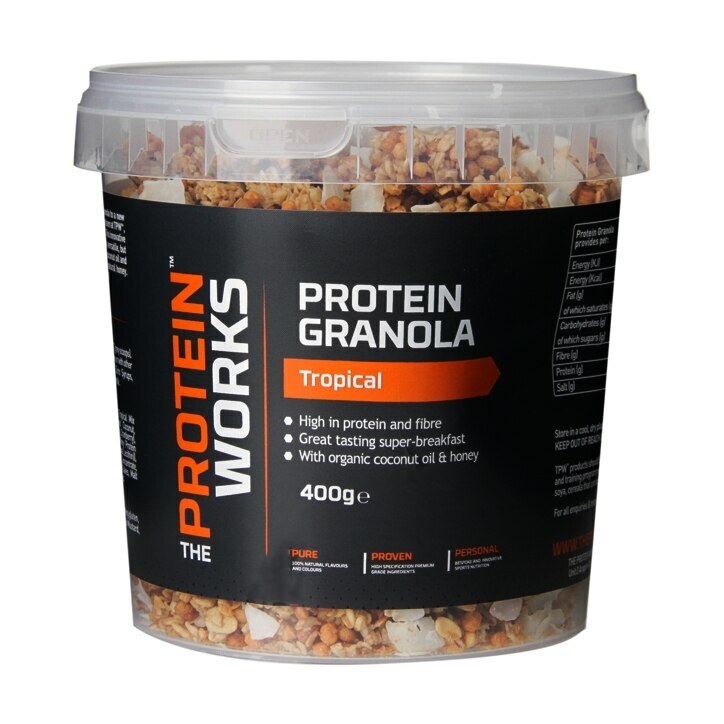 The Protein Works Protein Granola Tropical is rated 4.0 out of 5 by 2. Rated 3 out of 5 by Jetkj from Mixed tasty crunchy granola I bought this for the first time and it's really nice. So far I have eaten it by itself, added milk and to yoghurt. Still half a pot left so will continue to experiment. Try it.